Abang Johari launches SELPI at Kampung Pichin. SERIAN: Sarawak is all set to develop three crucial basic infrastructures as it strives to become a developed state. 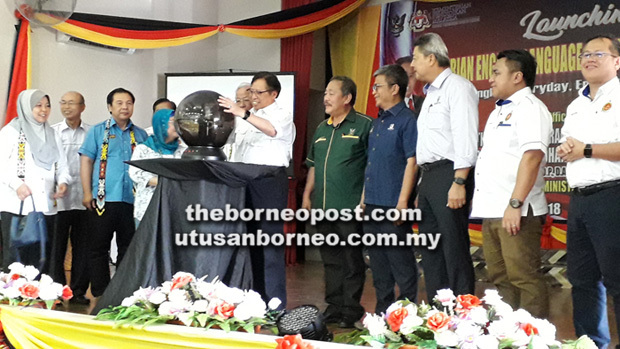 Chief Minister Datuk Patinggi Abang Johari Tun Openg said the state government has decided to put in place cyber connectivity to connect fiber optic, clouding and high speed internet. He said if the state could have the cyber connectivity in place, there wouldn’t be any black spot, meaning every part of Sarawak is connected through technology. He then moved on to stress the need for Sarawak to be physically connected through roads. “Vegetables cannot fly directly by Internet. Your fruits cannot, meaning we have to upgrade our road infrastructure,” he said at the launch of Serian English Language Proficiency Initiatives (SELPI) at Kampung Pichin here yesterday. Abang Johari lauded the development of Serian, saying unlike during his father’s time, Serian now has good roads. He said his father came to Pichin when he was the district officer and there was no road and also no power. “That time there was no electricity in Kampung Pichin. That was after the war, colonial administration. “But today you have good road connectivity,” he said. The chief minister stressed that the third basic infrastructure that Sarawak has to have is water supply. He said it was for that reason he had launched the state water grid, connecting the main pipelines through the state. “It costs us a lot of money. But never mind, because I’m trying to get money. Hopefully by July we will have regulatory control over our oil and gas. “Regulatory control means they have to comply with our law. I have said it, it’s not hot air. I will do it for the sake of people of Sarawak,” he said. Abang Johari added that the state constitution said Sarawak has regulatory control over its land mineral. “I want to deliver. Once I deliver then people know. At the moment, of course people are doubtful whether I can do it or not. But Abang Jo will do it because it is already there in our constitution. I will abide by the provision of our constitution,” the chief minister said. He envisioned that the moment Sarawak achieves road, cyber and water connectivity, the only thing that it would need is creativity. “Now, our administrative system has to produce a creative population.